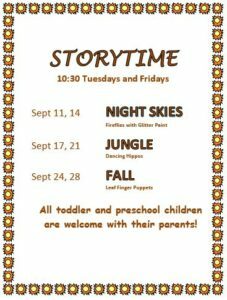 Come join us for some fun storytimes in September! We’ll be finger-painting fireflies. We’ll make dancing hippos and leaf finger puppets. And we’ll sing fun songs using scarves, rhythm sticks and bean bags.